When the Peace & Justice Academy was conceived back in 2008 it was an experiment in hope. Since opening our doors in September, 2009, the experiment has been, in our estimation, an enormous success – a success in every way except one. We have not been successful in enrolling students to the school. Based on our projected enrollment of returning students and new students who have made a commitment, we will not have the revenue necessary to further sustain the school. At this time the board of directors has decided to cease operations for the school at the end of May, 2015. 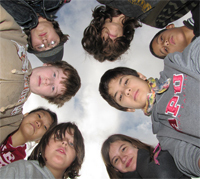 The Peace & Justice Academy is a fully-accredited, innovative middle school founded in a Mennonite tradition, but open to students of different faith traditions or no faith tradition. We offer life lessons in social justice to complement a challenging academic core of college prep classes. We seek to take the problems of the world out of the philosophical realm and make them real. We teach life skills in the expectation that our graduates will leave with tools that will allow them to engage the real world and – most importantly – to change it. The Peace & Justice Academy was founded in 2008 by two dedicated educators who, through their experience in more traditional forms of education, saw how undervalued the minds and hearts of tweens and teens were. So our teens study the intricacies of algebra and geometry, and fund microloans for people all over the globe with money they DO NOT get from their parents. They not only perform community service, but learn the causes and cures of societal ills - and learn to empathize with those they serve. They study the lives of well-known and little-known peacemakers, and learn restorative justice techniques to use themselves. They ponder the ins and outs of the US Constitution, and write their own Community Covenant governing their actions towards their classmates and teachers. They also do the majority of their homework at school during our extended day, allowing both collaborative work and teacher assistance. We hope that you are intrigued enough to find out more about the kind of education we offer at The Peace & Justice Academy. There’s a lot of information here on our website, but we welcome your phone calls and emails.